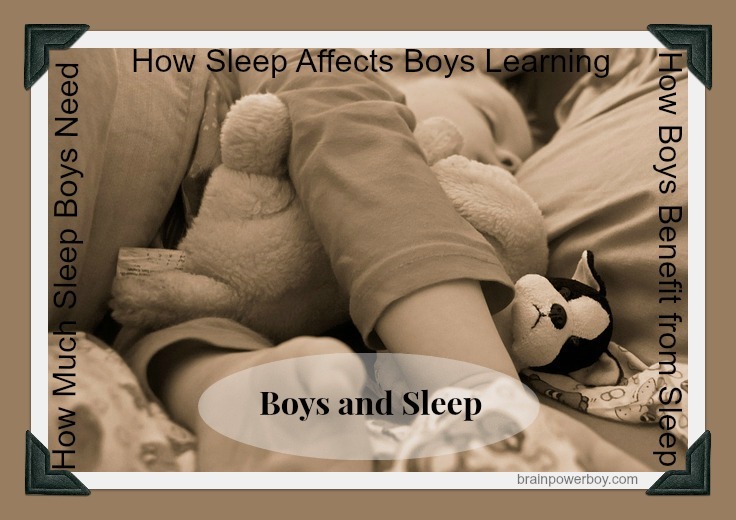 Did you know that sleep affects boys’ learning? It does. Big time. Sleep has such an impact on learning that if your boy isn’t doing well in school or you feel there are learning issues, you really need to take a look at the information here and see if lack of sleep might be one of the culprits. Read on for important information on how sleep affects boys’ learning and how you can help your boy develop good sleep habits and protect his learning life. When I read that boys as young as 9 were walking into class with Monster, Red Bull and Starbucks drinks because they were trying to stay awake I was saddened. Why is this happening? Is it a fad or are boys really that tired? After looking into it a bit I can say that many boys are that tired and it isn’t only boys who go to school. Lack of sleep is having a direct impact on the learning abilities of boys. Learning is directly affected by many factors. Stress, nutrition, surroundings, and proper rest all come to mind. Sleep is one thing that this busy society tends to discount. Some boys are so busy that it would be impossible for them to get enough sleep on a regular basis because they are simply not home long enough to do so. They are involved in so many activities and take so many lessons, that between those things and the loads of homework they have there are not enough hours in the day for them to get it all in. Parents are also sleep deprived—no surprise there, but what are parents teaching boys by walking around half-asleep and reaching for a Starbucks to wake up? As you can see the benefits are great. Sleep plays such a big role in our health and our well-being that making it a priority is very important. I really think the emotional balance one especially comes into play for boys. When boys I know don’t get enough sleep they have a difficult time controlling their behavior in a way that they (or others) feel comfortable with. If they are tired–it shows up in many ways. After reading a lot of articles on the subject, I can say that sleep definitely plays a role in learning. The effects of lack of sleep can have a “dangerous cumulative effect” which is a big problem as children need more time to get back to their normal “neurocognitive functioning” than adults do. A learning deficit can happen when children are young and this can have an effect on their ability to learn throughout the years. Think about how sleep affects boys’ learning and then think about why this lack of sleep is occurring. Life is busy. Asking yourself a few questions about your family’s sleep habits is worth the effort. Are you home long enough for your boy to get a good nights sleep? Are you always rushing, eating late, staying up late and having difficulty getting up in the morning? Are the kids crabby and tired? Make any changes you feel would help the situation. I had to make a change for myself. I was on screens too late and wasn’t feeling rested in the morning even though I slept the same number of hours. It seems that artificial light from screens or the new energy efficient bulbs also play a part in sleep loss (watch for an article on this soon.) We also make changes in my family to make for more relaxed evenings. Find your family’s best sleep patterns (each person’s needs will likely be different) and move toward what works best of your family. How much sleep do we need? I looked at over a dozen sleep charts and they all gave slightly different sleep recommendations for each age. They also listed the ages in the charts differently—what is a mom to do? Well, I decided this didn’t have to be so hard and you should not have to dig through that many charts! Much of this is basic information; that the “experts” disagree doesn’t really surprise me. In the end the chart that made the most sense to me was from WebMD. They listed ages in a way that made sense. While some charts list infant through 2-3 months and give the same amount of sleep for those ages, moms know that there is a big difference in sleep patterns between a one-week-old and a 2 month old. The only thing I didn’t agree with on their chart was the amount of sleep that teens need. There are several opinions on this. I went with the numbers that show a greater range of sleep is needed. Teens need quite a bit of sleep. I think their sleep needs tend toward the 9/10 hour range. It is not that they don’t want to get out of bed in the morning they just need more rest. Teen bodies are changing and their brains are changing. They need a lot more sleep than most of them get. There are big changes happening in the bodies and minds of boys at all stages of life. That makes getting enough sleep all the more important. Learners need sleep and we are all learners. You can help boys realize the importance of sleep by pointing out that while all people are different and have different sleep needs there are some guidelines that help our brains and bodies to be at their best. Old fashioned naps may help some boys but most do not want to miss out on anything and resist napping from an early age. Dim the lights in the house and his room 90 minutes before bed. Have darkening shades or window coverings. Help him to find his natural sleep rhythm and how much sleep he needs. Turn off screens one+ hours before bedtime. 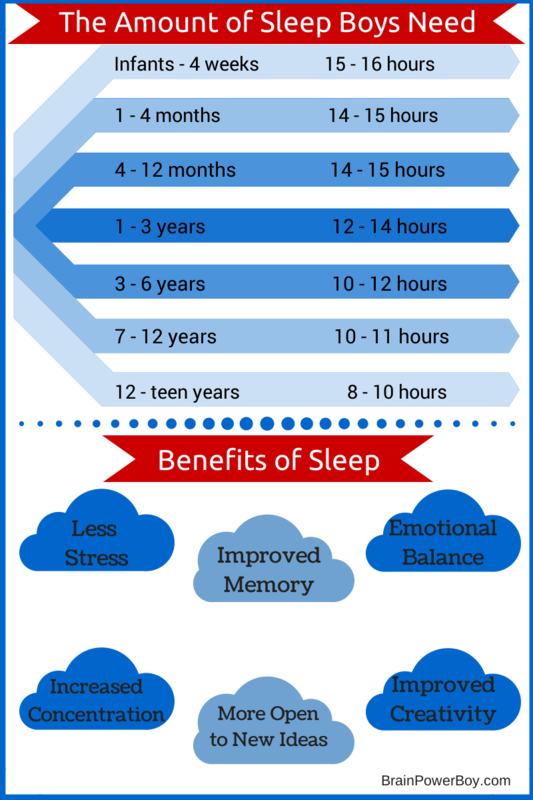 Talk about the importance of sleep and how it affects learning. Make bedtime a pleasant time. Enjoy spending a bit of time together in the evening at bedtime. Read or tell stories, listen to relaxing music, talk about the day, enjoy sharing things that are important to you and your boy. Do this as your boy grows up as well. Make it a habit to always spend at least a few minutes together as you end your day. Many sleep experts recommend you do not allow reading in bed to train your body that beds are for sleeping. I will have to respectfully disagree with that as reading in bed is one of our favorite ways to wind down before sleeping. Reading is one of our main ways of learning. I see no issue with reading before going to sleep, especially if it is helping us to learn more about what we are interested in. Other than having to read “one more chapter” it has not had any negative effects on our sleep patterns. If possible, let your boy go to bed when he is tired and get up when he is rested. I know this is not something that every family can do but letting a child follow his body’s lead is something that will benefit him when he doesn’t have you there telling him when to sleep and when to get up. It is also helps him to develop a healthy relationship with sleep that will benefit him throughout his life. Every year when the time change happens and we “spring forward” or “fall back” my son and I are out of it for a couple of weeks. The time change doesn’t affect my husband at all but for us it is not pleasant. We adjust our schedules and make the best of it but because our sleep patterns are disturbed we can really tell that we are not as clear-headed during these times. This makes me more certain than ever that sleep really does have an impact on learning and that natural sleep patterns work best. We took a look at how sleep affects boys’ learning. Are you going to make any changes based on this information? As I said, I did and am happy with the results. Natural sleep patterns are often interrupted by busy lives. Trying to slow down a bit and not have so many places to be. This might help your boys get enough sleep. Even having some down time before bed will allow them to slip into sleep in a more natural way. Like learning, sleep is personal. Some people need more sleep than other and some need much less. The information provided here is not meant as a mandate—boys age 6 must get X amount of sleep—but is presented as food for thought. Sleep is important but it doesn’t matter what time a child goes to bed as long as he doesn’t have to get up before he is rested. If that happens once in a while, no big deal but a big sleep deficit on a regular basis could cause health, learning and various other problems. Sleep and learning go hand-in-hand. You simply cannot learn something and remember it when you are exhausted. We are also more open to learning new things when we are not tired. Even though studies show that effects from screen time and lack of sleep are real and are cumulative, the good news is researchers think the effects can be reverted simply be getting enough sleep on a regular basis. Easy fix. If you are up most of the night and need Mr. Starbucks to get you through the day because you have to get up early, keep in mind that your boys are watching. Helping your boys (and your whole family) develop a good feeling about sleep now will benefit their learning throughout their lives. Do you have a sleep and learning story to share? I would love to hear it. Please leave a comment below or contact me here. Hi Sheila – thanks for an interesting post. My 6-year old looks permanently exhausted and is on a hair-trigger emotionally speaking, with outbursts of tearfulness or rage over seemingly trivial events. He seems to have no ability to concentrate and is easily distracted (by himself, mostly! ), is constantly active but unproductive and is unrecognisable as the quiet, gentle, thoughtful little boy he was before starting school. Even during the summer recess this has worsened, despite regular sensible bedtimes and many relaxed, unstructured days. I am convinced these issues are sleep-related, recognising many of the ‘symptoms’ as those I suffer when insufficiently rested, but he seems ‘wired’ and will wake early even after a late night. I do wonder whether the fact that he is not reliably dry at night has an impact on this, although we have never put any pressure on him in this regard or made a big deal about it. If you have any insight on any of this it would be great to hear! Thank you for the nice comment and for sharing your situation. I am sending you an email. I’m new to your site and very excited to look around. By chance I read the comments on this post, and I could have written Zoe’s comment word for word (except for the schooling part, we homeschool) So I too am curious about the “not reliably dry” at night factor. Would you mind sharing your knowledge with me as well? Thank you immensely. Hi RAZ, Welcome! I am so glad to hear you are excited to look around. Watch for an email from me. I’m sorry to hear he is having trouble falling asleep. It is good that you are homeschooling as you can adjust your schedule to meet his needs. I’ll send you some information to check out. Best wishes. Thank you for stopping by and leaving a comment.